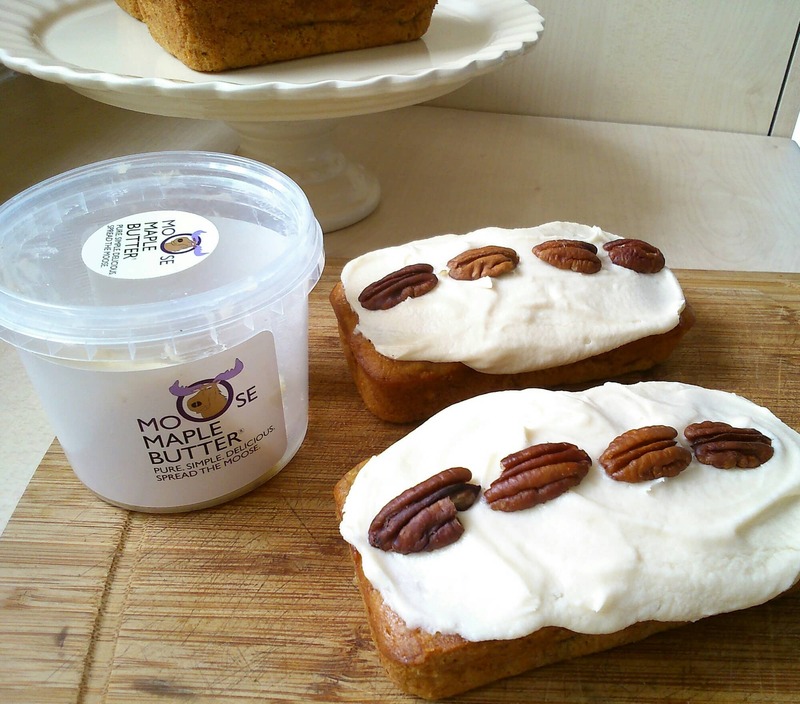 Recently the wonderful people who make Moose maple butter were kind enough to send me a tub. If you’ve never experienced the joys of maple butter spread on a hot piece of toast, let me tell you you’re really missing out! I’m not exaggerating when I tell you it’s heavenly. It contains no preservatives or additives – just butter and pure Grade A maple syrup. Yum. Moose maple isn’t available nationwide yet (come on, retailers!) but if you visit the moose maple website you will find a list of current stockists. Preheat the oven to 180c. Grease and line your loaf tins, or use cake release spray. Sieve the flour and baking powder in a large bowl. Stir together the mashed bananas, melted butter, sugar, vanilla and eggs until smooth. Pour this mixture into the bowl of dry ingredients, stirring gently until just combined. Take care not to overmix. Divide the batter between your loaf tins, filling them 2/3 thirds full. Bake for 25-30 minutes for the smaller loaves and 40-45 minutes for the larger ones. When they are risen and a skewer inserted in the middle comes out clean, remove from the oven and transfer to a wire rack to cool. Beat the ingredients together until very light and fluffy. 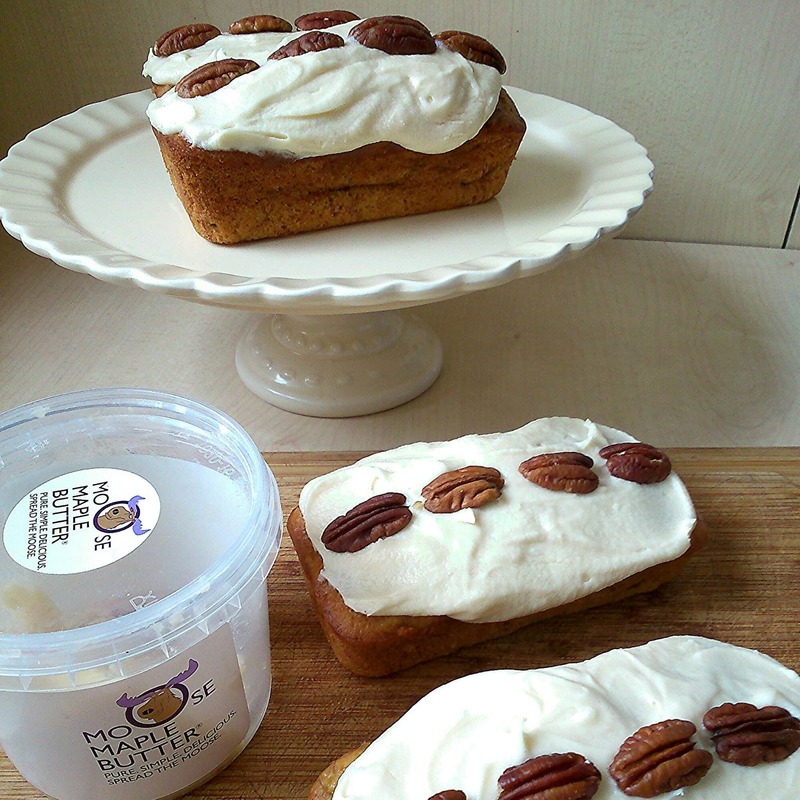 Spread the maple buttercream over the cooled cakes and top with pecans. I loooooove maple butter, though I usually make my own at home. I will have to make these loaves! Banana bread is one of my favorites. 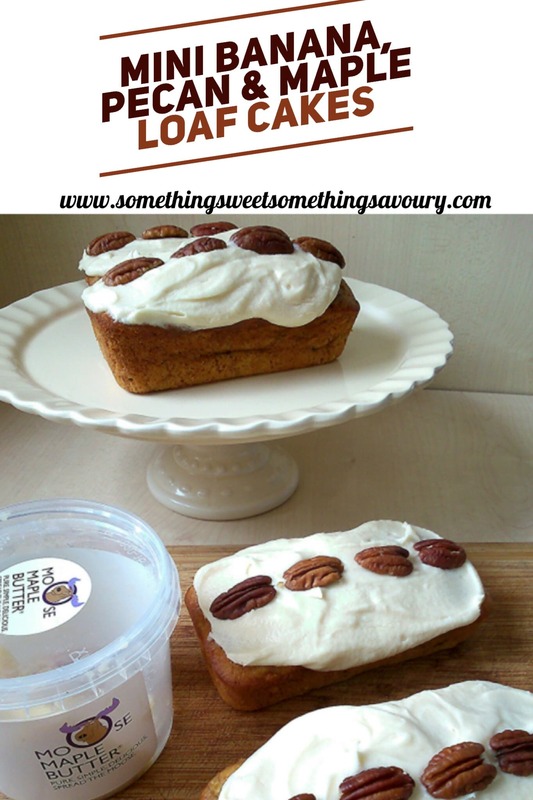 I love banana bread and this looks so delicious! Perfect for breakfast! These look BEAUTIFUL! I love the sound of that maple buttercream! Mmm!! Thank you 🙂 Maple butter is so delicious! These maple loves look so good! I love the combo of bananas and pecans too! I think I am drooling on my keyboard right now.. I feel like I really really REALLY need Maple Butter in my life! Yes I’m sure you could 🙂 I might just try it out myself! you would LOVE it Heather!